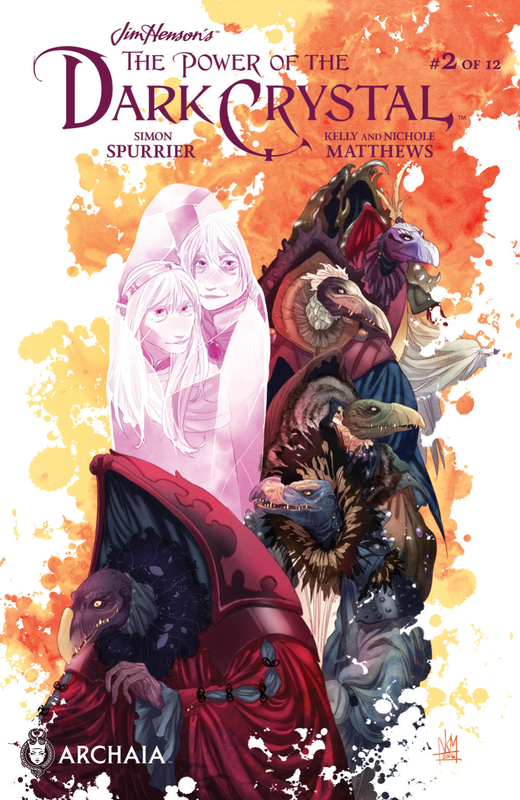 The Power of the Dark Crystal #2 Review – AiPT! Jen, Kira and Fizzgig have awoken. A lot has been happening since they fell into their last slumber. They wake to discover a young Fireling is trying to shatter the crystal. Our Fireling friend is on a mission to save her people and will not be swayed. As you can imagine, the idea of cracking the crystal is absolute lunacy. It was the crack, that missing shard, that caused the Skeksis to rise in the first place. His “Eminence” is furious and ready to jail the Fireling and Kensho. It is this ruckus that arouses Jen and Kira from their lengthy slumber. His Eminence is still an enigma. Outside of knowing that he is power hungry and manipulative, we do not know who he is and how he came to be in this position. We are left to assume that he has just taken advantage of Jen and Kira’s penchant for napping to rise to power. He is in charge of the castle, its staff and of course the crystal. A once a peaceful kingdom with a healing crystal has become a lucrative business that exploits the poor people of Thra; anyone who wishes to experience a brief moment of the crystal’s healing power must bring an offering and his Eminence makes certain that their payment is equitable. We soon discover that the Eminence has been hiding the truth about the planet dying. He employs a bit of his own trickery to change images of the planet and fool Jen and Kira about its well-being despite Kensho’s objections. Apparently his Eminence is also a climate denier. This guy is very quickly proving to have a Skeksi’s sense of morality. The Power of the Dark Crystal #2 is an engaging story from page one. Simon Spurrier has done a wonderful job of capturing the original characters and the world of Thra. The newest Gelfling character, Kensho, possesses a kindness that is endearing. His instant comradery with Thurma is reminiscent of the story of Jen and Kira. Aughra plays a larger role in the second issue. She arrives half way through the story to unleash a verbal smack down. When Aughra tells you to get in line – you listen. Let’s hope her prophecy can save Thra a second time. Kelly and Nichole Mathews have really nailed the art; starting with the cover and its tower of Skeksis. The Skeksis looks as if they fell off the screen from the original movie. You can tell from one glance that these are sinister creatures. The beautiful work, that I assume is watercolor or the digital equivalent, captures the fine detail of fur, fabric folds and the glint of the Skeksis’ sharp teeth. The Fireling’s flames are beautifully lit and actually appear to glow. Did I like it? Absolutely. This story captures your imagination.